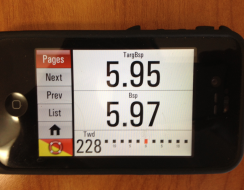 The power of Expedition Navigation and Routing Software in the Palm of your Hand! Now being used in over 24 countries! Available at the iTunes App Store and Google Play. There is a new forum on-line just for Expedition and Ventus users. We will be moderating the forum along with world class navigators including Will Oxley, Peter Isler, Wouter Verbraak, Campbell Field and Artie Means. Our goal is to help all navigators in the use of Expedition Software and Ventus Apps. Check it out and regiter now! Pebble Watch support is now available for Android devices in the just released Version 1.11. <Click> here for Information and Instructions. 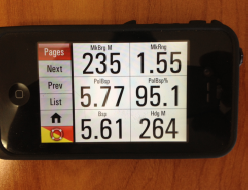 Here is the first input from our new Pebble Watch app for Ventus PRO. Ventus Navigator and Navigator PRO give you the complete wireless handheld solution for Expedition Navigation Software. Take full advantage of all the power built into Expedition wirelessly from anywhere on the boat. If you currently use Expedition, clearly the most powerful navigation and routing program on the market, or are considering moving to it, this is the must have addition. Ventus PRO is the complete solution; able to receive all the data Expedition puts out and send commands back to Expedition for key functions. countdown/count up timer or a revolving 5 minutes timer. * Set (ping) the ends of the Starting Line. Bearing back to the MOB Mark. * Display Strip Charts both TWD and TWS. you don't need the ability to send commands to Expedition. "We have been using technology on the boat for the past couple of years – the challenge has always been that you need the navigator sitting downstairs to make good use of it! Ventus has allowed us to get the navigator up in the cockpit and part of the action. The ability to have constant visibility of all of the key metrics allows us to make smarter and quicker decisions about course and sail choice. Glad to have you as part of the team Ventus! Bob Cox, Owner of "Nine Dragons" 1st Place Class B 2014 Audi IRC Australian Championship. Brilliant; Fantastic in its functionality and simplicity, I insist on using it on all the boats I race on. I just purchased another three iPod touches plus waterproof pouches for my German JV45 team, and we already purchased a PRO version. Also the tactician on Hanuman is taking this on for his British Soto 40 team, and another crew member is going to bring it to his Volvo Ocean Race team. Last week I sailed the Round Ireland Race on an Open 60 with an Irish team. The boat didn't have a deck screen, and with Ventus on deck we managed to nail the start making a clear jump on the fleet. In short, I am spreading the word for you and it is gaining momentum in Europe. I have multiple customers that are keen on having a light version of Expedition for the iPad, iPod, or Smart Phone...."
I’m very excited to have Ventus Navigation, it is worth the money, it is one of the best investments in the past 5years! "Ventus Navigation helped with our Sydney to Hobart race win!!" Dr. Darryl Hodgkinson - Owner of Sydney/Hobart winner "Victoire"
Thank you for your feedback with this. We do have 2 separate networks. We installed Ventus Pro and it worked instantly, without issue. We could still run one iPad with the VNC connection to the laptop on an ad-hoc network and Ventus software on multiple devices with our second wireless network. Its an all carbon boat (Volvo 70) and we had no issues cross the entire boat. It certainly proved useful and we will continue to use it in the future. Peter Elkington" Navigator on Volvo 70 "Black Jack"
"Thanks for this.... Just downloaded Ventus PRO and it looks GREAT! Once again you have nailed it. I will give it some race action in the coming weeks and report back. "Your app saved our bacon last week. Our 20/20s failed just before the long race at Hamilton island, but the WTP and tablet were still working so we bought a couple of copies on the way to the start." I'm a big fan of putting good navigation information in a package smaller than a tablet - not only is it easier for the navigator to carry around but it also makes specific data accessible to other members of the crew without having to rely on additional deck screens or fixed displays.